The House passed a proposal Monday that would give the green light to Enbridge to build a controversial pipeline across northern Minnesota, a month before the Public Utilities Commission makes its decision on the project. HF3759, as amended, sponsored by Rep. Dan Fabian (R-Roseau), was passed 74-51 after more than an hour of debate. It now heads to the Senate, where Sen. David Osmek (R-Mound) is the sponsor. Fabian said the pipeline would be a “tremendous asset” to the state, adding his bill has “very, very strong support in my part of the state” and across northern Minnesota. 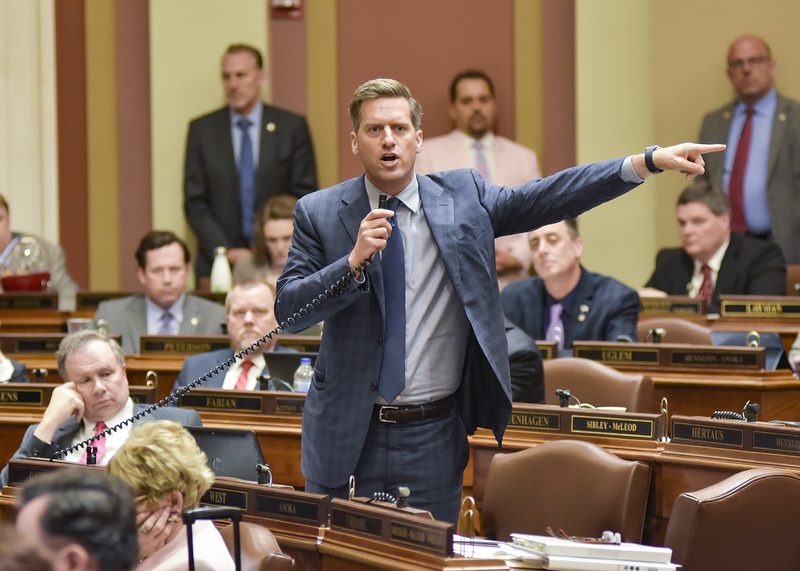 Other supporters of the measure, including House Speaker Kurt Daudt (R-Crown) who stepped down from the rostrum to debate the bill, said it would bring jobs to the area. Members also noted the pipeline would address a public safety issue, saying it’s safer to transport oil through the state in pipelines rather than trains and trucks. Enbridge wants to build a 337-mile pipeline along a partially new route to replace its current 282-mile Line 3 pipeline. Enbridge’s preferred route would carry crude oil from Canada, across 12 northern Minnesota counties, to the company’s terminal in Superior, Wis. The bill would require the Public Utilities Commission to issue a certificate of need and route permit for the pipeline by Dec. 31. It specifies that the route permit would be for Enbridge’s preferred route, with the commission allowed to “deviate incrementally” if it determines it’s in the public’s interest. The state has been reviewing this contentious project since 2015, with the commission expected to make its final decision in June on whether to allow the replacement. Last month, an administrative law judge recommended the commission grant Enbridge’s certificate of need, but only if the pipeline follows Line 3’s current route and not Enbridge’s preferred route. Fabian said Minnesota has a “slothful” regulatory process, noting it takes way too long to get to a decision. “We’ve got to do something to speed this process up,” Fabian said. She said the bill ignores the commission’s process and sends a message to the Minnesotans who testified during the regulatory process that their voices don’t matter. Rep. Raymond Dehn (DFL-Mpls) asked why the House was debating the bill, because it wasn’t Enbridge’s idea. He added that the bill would “circumvent” the commission’s process, which is important because legislative sessions aren’t long enough for lawmakers to get all the facts to make a decision like this. Others said bypassing the regulatory process would prevent the commission from including rules on what Enbridge would need to do if there’s a leak in the pipeline. “I don’t support this bill for the reasons that this bill takes away the ability to negotiate [safety],” said Rep. Tim Mahoney (DFL-St. Paul), noting Gov. Mark Dayton has been “exceedingly clear” with how he feels about the bill and its attempt to take power away from the commission. During a House Job Growth and Energy Affordability Policy and Finance Committee hearing on the bill in April, more than 20 people testified against it, including conservation advocates, Native Americans and Commerce Commissioner Jessica Looman. Many mentioned the environmental and tribal impacts the new pipeline could have, with some saying it would bring the pipeline protests that happened at Standing Rock in North Dakota to Minnesota.